Heat vegetable oil in a large skillet over medium-high heat. Place pita pieces in skillet; fry in batches until lightly browned. Drain on paper towels. In a large bowl, combine romaine lettuce, tomatoes, cucumbers, bell pepper, green onions, mint leaves, parsley and cilantro. In a small bowl, mix together lemon juice and white wine vinegar. Season with salt, lemon pepper, onion flakes, celery salt and garlic powder. Stir in olive oil. Gently toss salad mixture with fried pita pieces and dressing. Serve. 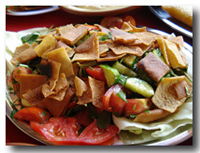 *Fattoush image (C) Aziz (2007). Used under the Creative Commons Attribution-Share Alike license.